Hello, hello! Today I want to show you a super cool new way to build a flower wall. We built this beaut as a communal building experience for this year’s Slow Flowers Summit attendees. If you haven’t heard about it, read about it here. Need I tell you that its foam free? No, I do not. Of course it is! We’ve used this flower wall technique in the past for Seattle’s 2016 Art Fair; where it wowed outside during a hot, sunny August day in Seattle (hot and sunny DO happen in Seattle, we just don’t tell you about them). The point is, it holds up in heat, is pretty easy to construct, and is more sustainable than a van full of foam. This particular construction is strong enough to be stacked into an enormous wall. You can see such enormous wall stacking and construction of this in video from last year’s ART FAIR if you click here! PS, IF YOU ARE HERE LOOKING FOR FLOWER WALL PRICING AND SPECIFIC INGREDIENTS, WE ARE GIVING THAT AWAY TO FOLKS WHO WANT TO BE PART OF OUR EMAIL FLOWER POSSE. THERE’S A LINK AT THE BOTTOM. But back to our flower wall demo. About a month ago, I had the privilege to speak at Seattle’s first Slow Flowers Summit. Have you ever had a communal experience where you are surrounded by inspiring people and all you can think is “YASSSS, These are my people.” And suddenly it’s all you can do to NOT throw your arms around complete stranger and babble like you’ve been friends since you were 13? Like you ARE 13?! This was one of those times. My talk was about Reinvention. But we also were asked to demo this wall. Really THE wall. We got the royal treatment as the Seattle Wholesale Growers Market, SUOT farms and Alaskan Peonies donated buckets of flowers. Ehem, did I mention that we got the first cut of Alaskan Peonies, which were then airplaned (is that a verb? … is now.) with their human caretakers. These peonies were larger than my face, and my brother says my face is large. For Flower walls, we use two methods. This one is the “moss and cage” or the “moss sandwich”. Our other go-to wall is a bioboard wall. We demo that soon. Stay tuned for a DIY video on how we made the Queen Bee’s backdrop, which is equally excellent but is useful in a totally different way. Here’s a breakdown of why you would use each wall..
(2) 4 x 6ft display grids, we got ours from Grand and Benedicts but you can find them at any retail display fixture store. If you are in a city, you probably have one. Cover one side of each grid with chicken wire. To get an idea of how this will look, try imagining the structure like a sandwich. The “condiments” (chicken wire) will be on the inside of the bread (the grid) to hold in the meat (the moss). For us, two long pieces of chicken wire was just the right amount to cover one side. 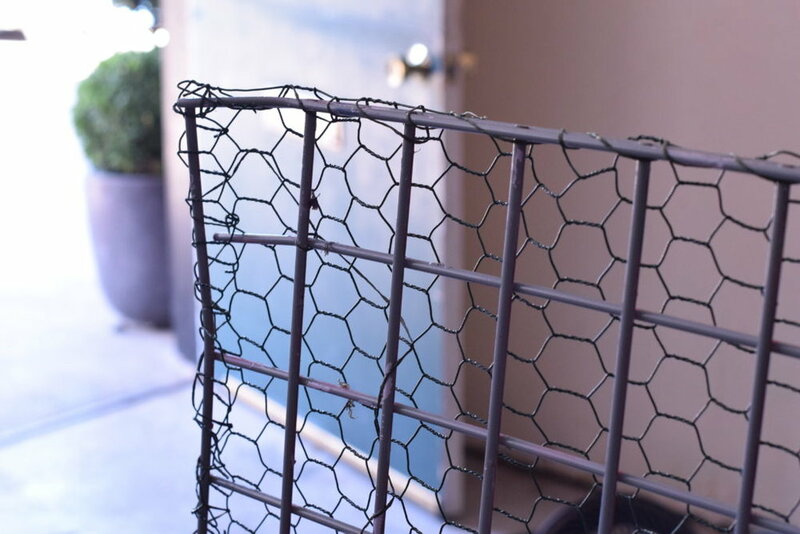 Starting with one piece of chicken wire, secure it to the grid with bind wire. Make sure you weave around the perimeter and throughout the middle. This keeps it from slipping or bulging. To save some bind wire, I cut a couple 3″ pieces and did little twist ties in random spots. We are going to use the 2X2s as spacers, this ensures your thickness is uniform. We are going to pack in the moss but the spacers ensure that if there is a thin/ or dryer spot, the face won’t warp. It’s also critical if you are making a wall that is larger than your grid size (like in that video). Measure the length and width of your grid. Cut your 2X2s to size. Remember to cut your short ends to account for the width of the longer pieces. We will want the shorties to fit inside the long pieces. All spacers should be attached under the perimeter of your grid. Choose a drill bit that gives enough room for one zip tie to slide through. Next, drill a hole about two inches from the end and then continue to drill a hole every 4″ or so. Once they’ve been drilled, attach the wood spacers to the grid by securing a zip tie through every other hole. Next, cover the other grid with chicken wire as you did in Step 1. 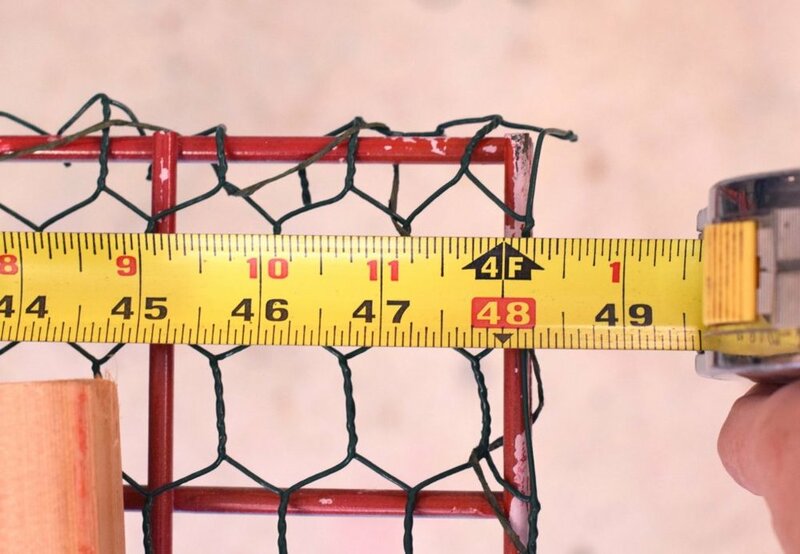 You won’t need spacers on this one, just the chicken wire. This will be the top piece of ‘bread’ to our sandwich. 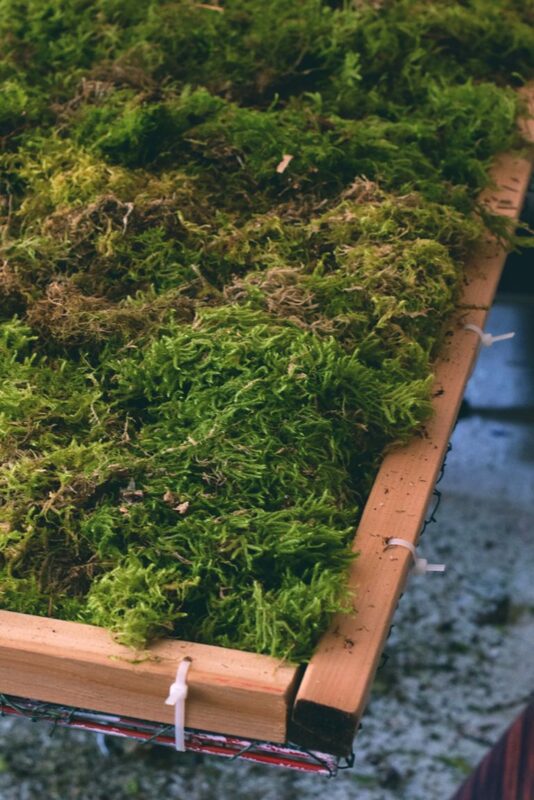 We’ll be adding moss to the grid with the spacers, so you may need to switch your setup now. Grab your 5 bags of moss and get to town! Don’t spread this sparingly; pack as much moss in as you’ve got. Its very important that this is thick. You want your stems to be lodged in the moss and hydrated. Too loose and your stems may stay but they won’t get as much hydration. Once every area feels full and even, lay the other grid on top of the moss. Grab more zip ties and connect the spacers to the top grid. Try adding one on one side then adding one on the opposite side for an even and super tight grid. Ensure your zip ties are rotated to the outside of the spacer- so your top grid can be cinched down right on top of the spacer. You’re almost done! Have someone help you move this outside or somewhere you don’t mind getting a lot of water on the floor. “Is it heavy,” you ask? Yes. Take your hose and drench the whole thing so that every area is dripping water onto the floor. Do it a few more times. You’ll want to give the moss a chance to really absorb as much water as possible. You can also pre-soak your moss before adding to the grid. That way you have full moss absorption but it is messier. We went for the less messy option this time. Prep your flowers, cutting the stems to about 3″-4″ long. Add in those darn flowers and foliage and consider yourself a Flower Wall Extraordinaire! The moss should keep it moist for a full day and probably longer, but I would test it in your neck of the woods to be sure. Although not necessary, you may want to build a boarder around it as we did with leftover bio-board and some wrapping paper. Timing: You can make this in advance but I would add a bit of flower glue to each stem to be sure it doesn’t dislodge in transport. I typically add greens in the shop and add all the flowers in on site. We’ve done this wall 3 times and I am ALWAYS impressed with how long the flowers last. They typically look great the next day and most of the flowers still look great days later. I include some images of what the flowers look like after two days squished in my hot van after the summit. You will be amazed. I am still conservative in adding flowers too far in advance but . I would urge you to test a patch in your area. Super thirsty flowers may not be a good idea for this wall type- though you can always tube your flowers and that works well. Particular species that I don’t use in this wall are Hydrangea, raspberry foliage, sweet pea, or any other herbaceous, soft stemmed flower or foliage. How much does this cost? Simply put, lots. Sign up for our Flower posse and we’ll go over that. If you’ve liked this information, you’ll like what you get as a part of our inner circle. CLICK HERE FRIEND, FOR THE GOOD STUFF! THIS INCLUDES THE PRICING DATA!! !